Copyright © 2015, Savino et al. Summary of the available and salient clinical research used to develop these evidence based recommendations. The care provided by emergency medical services (EMS) varies widely in the United States. The Institute of Medicine report, “EMS at the Crossroads,” notes that an area of improvement for EMS is the need for more uniform quality care and the need to develop measures for EMS quality.1 A major area of EMS quality that is difficult to measure is the prehospital protocols that EMS personnel follow while taking care of patients. These protocols vary widely between jurisdictions. In the state of California, EMS care is divided into 33 separate local EMS agencies (LEMSAs). These government agencies are a countywide or region-wide system of first responders and ambulance transporters that operate under one set of medical control policies. We performed a literature review of the current evidence in the prehospital treatment of chest pain and augmented this review with guidelines from various national and international societies to create our evidence-based recommendations. 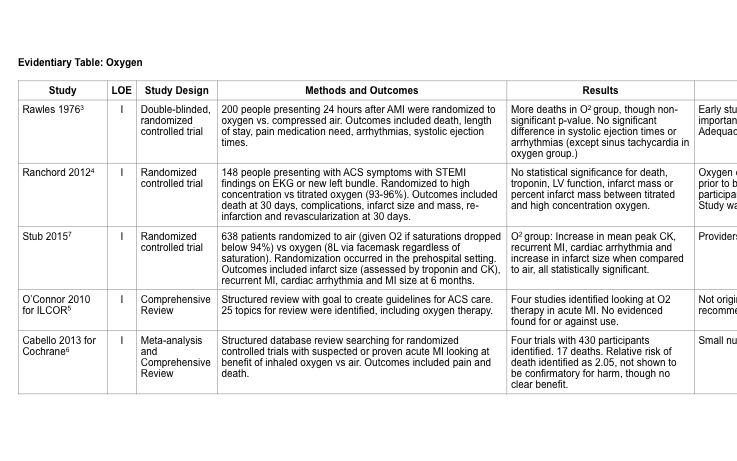 We then compared the chest pain protocols of each of the 33 EMS agencies for consistency with these recommendations. The specific protocol components that we analyzed were use of supplemental oxygen, aspirin, nitrates, opiates, 12-lead electrocardiogram (ECG), ST segment elevation myocardial infarction (STEMI) regionalization systems, prehospital fibrinolysis and β-blockers. A subcommittee of EMDAC endeavored to create a narrative review of the existing evidence for prehospital treatment of chest pain. The subcommittee chose by consensus the elements that should be included in any protocol for chest pain of suspected cardiac origin. Clinical questions regarding these interventions were developed in the population, intervention, control group and outcome format. Our population was those patients in the prehospital setting with chest pain of suspected cardiac origin. The intervention varied by clinical question. The control group consisted of patients who were not receiving the specific intervention, and outcomes were defined by resolution of electrocardiographic (12-lead ECG) findings, chest pain resolution, infarct size and mortality. The outcomes varied considerably depending on the individual study design. These commonly included cardiac events, rate of myocardial infarction (MI), arrhythmias, shock, death, length of stay, infarct size, need for percutaneous intervention (PCI) and/or ejection fraction. We relied heavily on recommendations made by various organizations that have performed systematic reviews and meta-analyses regarding these treatment interventions including the American Heart Association (AHA), the Cochrane Group and the International Liaison Committee on Resuscitation (ILCOR). We supplemented the recommendations from these organizations with additional literature searches through PubMed for each specific question. The process used for assigning levels of evidence (LOE) and grading our recommendations was taken from the American College of Emergency Physicians (ACEP) process of creating their clinical policies with slight modification to better fit our objectives. A committee of EMDAC reviewed studies and assigned LOE based on the study design, including features such as data collection methods, randomization, blinding, outcome measures and generalizability.2 A brief summary of the reviewed studies is available in an electronic appendix. LOE I consisted of randomized, controlled trials, prospective cohort studies, meta-analysis of randomized trials or prospective studies, or clinical guidelines/comprehensive review. LOE II consisted of nonrandomized trials and retrospective studies. LOE III consisted of case series, case reports, and expert consensus. Prehospital recommendations with a strong degree of certainty based on one or more LOE I studies or multiple LOE II studies. Prehospital recommendations with a moderate degree of certainty based on one or more LOE II studies or multiple LOE III studies. 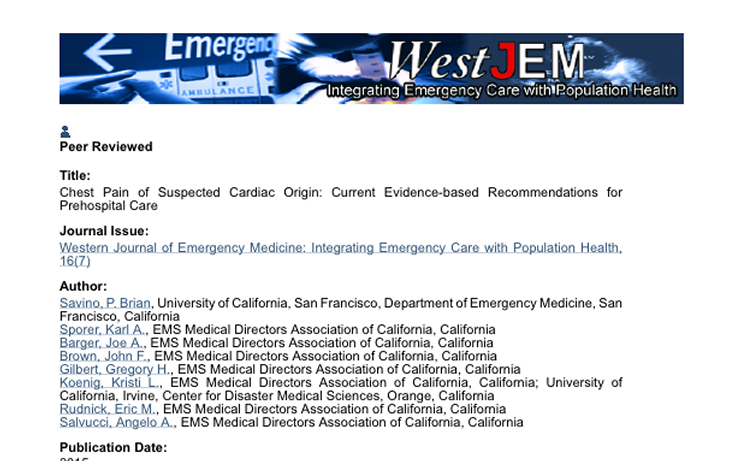 Prehospital recommendations that are based on only poor quality or minimal LOE III studies or based on consensus. No recommendation will be given in those cases where only preliminary data or no published evidence exists and we have no expert consensus. We may also withhold recommendation when studies, no matter their LOE, currently show conflicting data. 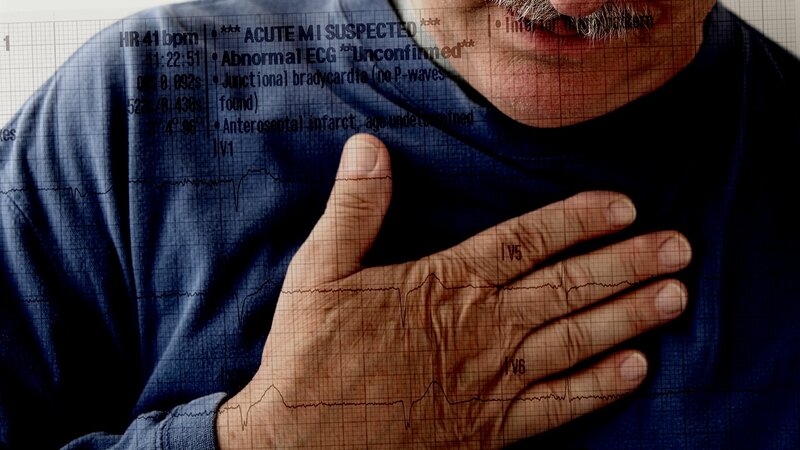 After answering the clinical question and providing recommendations for diagnostic and treatment interventions, each current chest pain protocol for the 33 agencies were reviewed for consistency with the recommendations. The clinical protocols were reviewed during the month of July 2015. Institutional review board approval was deemed to not be necessary for this review of publicly available research and clinical protocols. Does the prehospital administration of oxygen to patients with chest pain and normal oxygen saturations improve outcomes in cases of suspected acute coronary syndrome (ACS)? There is no evidence that the routine use of oxygen to patients with normal oxygen saturations provides any benefit, but may cause harm. Oxygen saturations should be titrated between 94%- 98% (consensus). Does the prehospital administration of aspirin to patients with suspected ACS improve outcomes with an acceptable rate of adverse events? 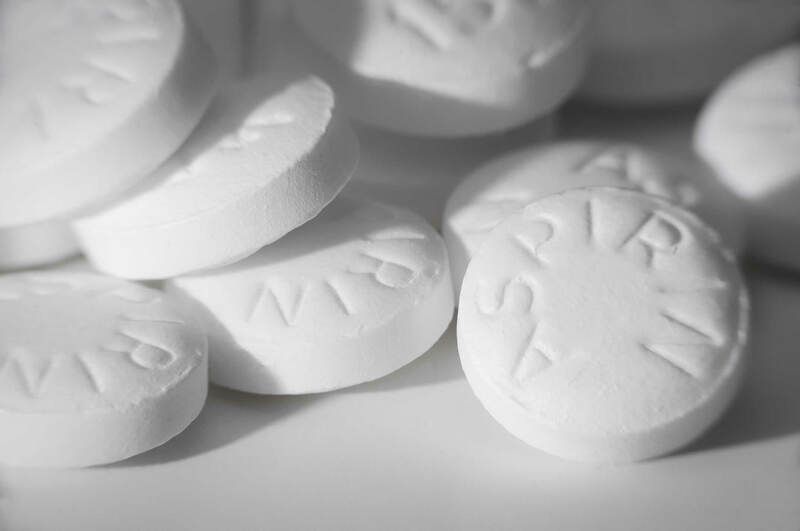 We recommend the administration of aspirin to adults with chest pain due to suspected ACS. In making this recommendation, we place a higher value on the benefits of aspirin (decreased mortality and decreased complications of MI), which outweigh the risks of adverse effects (gastrointestinal bleeding). Aspirin is contraindicated in the setting of known aspirin allergy. Does the administration of nitroglycerin in the prehospital setting to patients with suspected ACS improve outcomes when compared to not using nitrates? There have been no trials to specifically evaluate the usefulness of nitrates in the field or in the emergency department (ED) among patients with chest pain of suspected ACS.5 A reduction in infarct size (using creatinine kinase as a surrogate measure) was noted in those treated within three hours of symptoms in three studies of intensive care unit patients.14,15,16 There have been two trials showing that combined treatment with nitroglycerin and fibrinolytics may have a detrimental effect on reperfusion.17,18 There is currently not enough evidence to suggest clinical benefit or harm of nitroglycerin use in the prehospital setting. Contraindications with hypotension, defined as a systolic blood pressure less than 90mmHg, by expert consensus. Contraindications with suspected right side/inferior infarct. Contraindication with the recent use of phosphodiesterase-5 inhibitors for erectile dysfunction or pulmonary hypertension. Does the administration of opiates to patients with suspected ACS improve outcomes when compared to not using opiates? Clear benefit to opiate administration is unclear. There is a single study that suggested mortality and rates of infarction are more prevalent in patients who receive morphine with Non STEMI.5,19 No studies have been done with fentanyl among patients with chest pain of suspected cardiac etiology. If opiates are used, they should be administered intravenously and titrated to pain relief (consensus). Contraindications with hypotension, defined as a systolic blood pressure less than 90mmHg. Although it is reasonable to consider the early administration of opiates in selected patients without contraindications, insufficient evidence exists to support or refute its routine administration in the ED or prehospital setting in patients with chest pain of suspected ACS. There is only one poor quality study that demonstrated harm. In patients with suspected ACS, a 12-lead ECG should be acquired and interpreted by prehospital or emergency providers as soon as possible after first patient contact. The interpretation should be used in conjunction with the clinical signs and presentation for diagnosis and triage, including destination decisions. Repeated prehospital 12-lead ECGs may improve diagnostic accuracy of STEMI. Transmitted 12-lead ECGs may be useful in decreasing door-to-intervention times. The timely notification of the STEMI-receiving center is helpful in decreasing door-to-intervention times. Prehospital activation of the catheterization lab may also help to decrease door-to-intervention times. Computer interpretation of 12-lead ECGs may help to increase the specificity of the diagnosis, especially with less experienced paramedics. Does the regionalization of STEMI care lead to decreased door-to-intervention times and improved patient outcomes in prehospital patients with STEMI when compared to a non-regionalized program? There is a large body of evidence suggesting that primary PCI is superior to thrombolytics. There is also evidence suggesting benefit of STEMI regionalization programs in decreasing door-to-intervention times. We recommend EMS systems employ a regionalization program for STEMI patients that provide direct transport to PCI capable centers. In cases where timely transport to a PCI center is not possible (>90min), transport to a facility that can provide thrombolytic therapy is reasonable. It has been shown in multiple studies that primary PCI is the ideal method of reperfusion in patients presenting with STEMI.31 Timely PCI leads to decreased morbidity and mortality in this patient population.32,33 Current AHA recommendations call for a first medical contact to intervention time of less than 90 minutes and additionally note that the EMS system can play a large role in decreasing not only D2B time, but “total ischemic time,” as well.11,34,35 The AHA also recognizes that PCI is not always available and in these cases thrombolytics may be required.11 Regionalization of STEMI care does lead to decreased door-to-intervention times.36,37 The evidence for improvements in mortality and other clinical outcomes among STEMI patients are less well studied. Rapid inter-facility transfers of patients with STEMI presenting to a non-PCI hospital can reduce time to treatment. STEMI systems should include an organized inter-facility transfer process that includes inter-hospital agreements and ambulance dispatch protocols designed to minimize transfer time. In patients with STEMI and a prolonged time to primary PCI, does the use of prehospital fibrinolytics improve outcomes? There is a significant body of high-quality evidence describing the benefit of fibrinolytic therapy given to patients with STEMI when it is anticipated that primary PCI cannot be performed within 120 minutes of first medical contact.10,11,38,39 If prehospital fibrinolysis is chosen as the reperfusion strategy, there should be well-established protocols with a competency training program, performance improvement, and robust medical oversight. This is not currently in the scope of practice for paramedics in the state of California. For those patients with a STEMI, onset of ischemic symptoms within the previous 12 hours and primary PCI cannot be accomplished within 120 minutes of first medical contact, prehospital fibrinolytics can be considered. There should be considerable oversight for any prehospital thrombolytic program. Because it is not in the current scope of practice for paramedics in California, this could only be done as a pilot study with approval from the EMS Authority. Does the prehospital administration of a β-blocker to patients with an acute STEMI improve outcomes? While the prehospital administration of β-blockers does seem to show promise, there are insufficient studies at this time to make a prehospital treatment recommendation regarding their use in the field. All 33 agencies protocols were identified and reviewed for consistency with the recommendations made by EMDAC for chest pain of suspected cardiac origin. Every agency has a protocol relating to the treatment of chest pain, though these protocols vary significantly in content and organization. Examples of suggested language for protocol development that the committee felt was most consistent with the recommendations were taken from the agency protocols. Every agency has a component of oxygen administration in their protocol for chest pain. Routine use of oxygen, regardless of the patient’s oxygen saturation is recommended in 39% of agencies, with 54% percent of agencies advising a titrated dose to their providers (Table 1). Only four of the agencies had language specifically advising against the use of supplemental oxygen if the patient had normal oxygen saturation. All agencies advise the use of supplemental oxygen in cases of shock or respiratory distress, even if the patient has normal oxygen saturations. The use of aspirin for chest pain of suspected cardiac etiology is universal among our agencies (Table 2). There is no consensus on the dose of aspirin to be used. Sixty-four percent of agencies recommend a 324mg dose, 24% recommend a 162mg dose and 15% recommend either 162mg or 325mg dosing. There is also great variability in what are considered contraindications to aspirin use. Aspirin allergy is specifically noted as a contraindication in 58% of agencies and recent gastrointestinal bleeding is noted in 30% of agencies. Two agencies noted peptic ulcer disease as a contraindication and one noted asthma, chest pain radiating to the mid back and chronic anticoagulant use as contraindications. Some protocols clarify that aspirin is indicated in the setting of the use of other anticoagulants (e.g. warfarin) or of gastrointestinal disease without a recent bleeding episode. All agencies include sublingual nitroglycerin, either tablets or spray, in the treatment of chest pain (Table 3). One agency does not allow the use of nitroglycerin for patients with STEMI. Topical nitroglycerin paste is present in 36% of the protocols. Hypotension is noted as a contraindication to nitroglycerin use in 100% of the protocols; however, the definition of hypotension varies. A systolic blood pressure as less than 90mmHg is the definition of hypotension in 36% of agencies while less than 100 mm Hg is the definition in 52% of agencies. One agency (2%) uses less than 110mmHg as the cut off and three agencies (9%) do not define hypotension. Right-sided or inferior MI is a contraindication in 21% of agencies and phosphodiesterase 5 (PDE5) inhibitor use is noted as a contraindication in 91% of protocols. Opiate use for chest pain is recommended in all protocols. Morphine sulfate is the opiate used in 58% of agencies, while fentanyl is the opiate of choice in 15% of agencies (Table 4). Both medications are available in 27% of the agencies’ protocols. Hypotension is noted as a contraindication for 88% of the protocols. Of those that mention hypotension as a contraindication for opiate administration, 41% define it as a systolic blood pressure of less than 90mmHg and 45% define it as less than 100mmHg. One agency (3%) defines it as less than 110mmHg, and three agencies (10%) do not define hypotension. Prehospital 12-lead ECGs are used in all but one of the 33 agency (97%) (Table 5). Transmission of the ECG to a receiving facility is advised in 61% of the protocols. Computer interpretation of the ECG is mentioned in 82% of the protocols and some form of medic interpretation (whether by noting morphology or contacting the base hospital) is mentioned in 42% of protocols. Timely receiving center notification of STEMI is mandated in 94% of protocols. 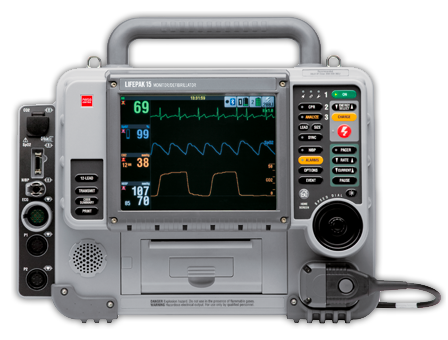 Serial 12-lead ECGs during transport of a patient with chest pain is practiced by 55% of agencies. All but one (97%) of the agencies has some form of regionalization of STEMI care. These systems are not uniform in design and the capabilities of the systems vary widely based on geography and access to PCI capable receiving centers. There are currently no agencies that employ fibrinolytics in the field. One agency received approval in the past for a trial study of prehospital fibrinolytics for STEMI patients but enrolled no patients during the trial study period. 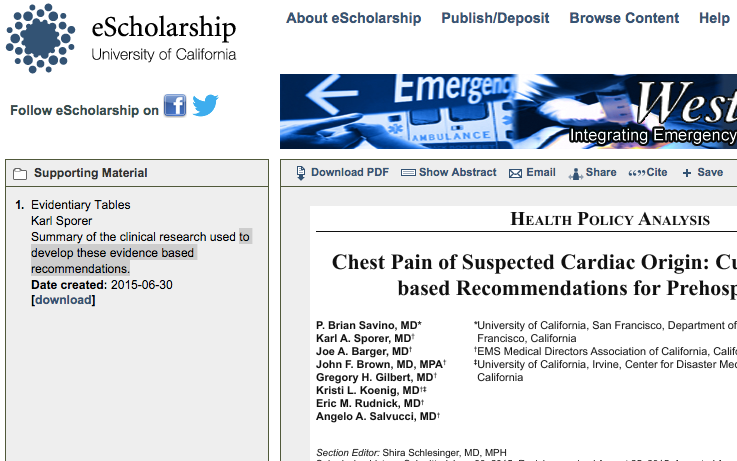 The chest pain protocols reviewed varied greatly in content and structure between LEMSAs in California. These government agencies consist of either a county or region that develops a system of care that include first responders, ambulance transporters, and specialty receiving facilities. These systems reflect the needs and demographics of that county or region and operate under one set of medical control policies. Nitroglycerin is used by every agency with a wide variability noted in delivery route. Few agencies noted a contraindication with right-sided infarcts, with one agency not allowing nitrates in any patient with STEMI to avoid this potential contraindication. Most agencies did caution use with PDE5 Inhibitors. Holding nitroglycerin for hypotension was universal, but the systolic blood pressure cut-off varied. Our recommended cut-off is a systolic blood pressure of 90mmHg. Opiates were also found to be used in all protocols with many agencies preferring fentanyl over morphine. It should be noted that studies with fentanyl for ischemic chest pain are not available to specifically recommend this agent for suspected ACS. Twelve-lead ECGs were used in all but one agency. The technique used to interpret STEMI varied between agencies with some using computer interpretation, medic interpretation or both. Most agencies notified receiving centers of their potential STEMI and many have transmission capabilities. Prehospital fibrinolytics, while not employed at any agency, may still have a place for some rural systems without timely access to regionalized STEMI centers. Currently, paramedics in California do not have this in their scope of practice. If such a system were to be put in place it would require a trial study and substantial medical oversight. While many states have mandatory protocols in place for their providers, California has allowed the individual agencies to develop and implement their own protocols. While this has allowed for flexibility among regions with different populations and financial and geographic restrictions, it may also contribute to health outcome disparities among the agencies. A study by Kupas et al. coined the term “model” protocols, which were found to be present in 17 states.43 In contrast with mandatory protocols, which require local agencies to adopt the state protocols, model protocols are in place as an option for local use, but not required. This respects the local agencies’ autonomy, but also provides a standard that can be adopted should a local agency need to create or change its protocols. Emergency Medical Services at the Crossroads. Institute of Medicine 2006. Available at: http://www.iom.edu/reports/2006/emergency-medical-services-at-the-crossroads.aspx. Accessed Jun 6, 2015. American College of Emergency Physicians Clinical Policies Subcommittee on Thoracic Aortic Dissection, Diercks DB, Promes SB, et al. Clinical policy: critical issues in the evaluation and management of adult patients with suspected acute nontraumatic thoracic aortic dissection. Ann Emerg Med. 2015;65(1):32-42.e12. Rawles JM and Kenmure AC. Controlled trial of oxygen in uncomplicated myocardial infarction. Br Med J. 1976;1(6018):1121-3. Ranchord AM, Argyle R, Beynon R, et al. High-concentration versus titrated oxygen therapy in ST-elevation myocardial infarction: a pilot randomized controlled trial. Am Heart J. 2012;163(2):168-75. O’Connor RE, Bossaert L, Arntz HR, et al. Part 9: Acute coronary syndromes: 2010 International Consensus on Cardiopulmonary Resuscitation and Emergency Cardiovascular Care Science With Treatment Recommendations. Circulation. 2010;122:S422-65. Cabello JB, Burls A, Emparanza JI, et al. Oxygen therapy for acute myocardial infarction. Cochrane Database Syst Rev. 2010;(6):CD007160. Stub D, Smith K, Bernard S, et al. Air Versus Oxygen in ST-Segment Elevation Myocardial Infarction. Circulation. 2015. Hofmann R, James SK, Svensson L, et al. Determination of the role of oxygen in suspected acute myocardial infarction trial. Am Heart J. 2014;167:322-8. Bosson N, Gausche-Hill M, Koenig W. Implementation of a titrated oxygen protocol in the out-of-hospital setting. Prehosp Disaster Med. 2014;29:403-8. O’Gara PT, Kushner FG, Ascheim DD, et al. 2013 ACCF/AHA guideline for the management of ST-elevation myocardial infarction: executive summary: a report of the American College of Cardiology Foundation/American Heart Association Task Force on Practice Guidelines. Circulation. 2013;127:529-55. Freimark D, Matetzky S, Leor J, et al. Timing of aspirin administration as a determinant of survival of patients with acute myocardial infarction treated with thrombolysis. Am J Cardiol. 2002;89:381-5. Barbash I, Freimark D, Gottlieb S, et al. Outcome of myocardial infarction in patients treated with aspirin is enhanced by pre-hospital administration. Cardiology. 2002;98:141-7. Bussmann WD, Passek D, Seidel W, et al. Reduction of CK and CK-MB indexes of infarct size by intravenous nitroglycerin. Circulation. 1981;63:615-22. Charvat J, Kuruvilla T, al Amad H. Beneficial effect of intravenous nitroglycerin in patients with non-Q myocardial infarction. Cardiology. 1990;35:49-54. Jugdutt BI and Warnica JW. Intravenous nitroglycerin therapy to limit myocardial infarct size, expansion, and complications. Effect of timing, dosage, and infarct location. Circulation. 1988;78:906-19. Ohlin H, Pavlidis N, Ohlin AK. Effect of intravenous nitroglycerin on lipid peroxidation after thrombolytic therapy for acute myocardial infarction. Am J Cardiol. 1998;82:1463-7. Nicolini FA, Ferrini D, Ottani F, et al. Concurrent nitroglycerin therapy impairs tissue-type plasminogen activator-induced thrombolysis in patients with acute myocardial infarction. Am J Cardiol. 1994;74:662-6. Meine TJ, Roe MT, Chen AY, et al. Association of intravenous morphine use and outcomes in acute coronary syndromes: results from the CRUSADE Quality Improvement Initiative. Am Heart J. 2005;149:1043-9. Ioannidis JP, Salem D, Chew PW, et al. Accuracy and clinical effect of out-of-hospital electrocardiography in the diagnosis of acute cardiac ischemia: a meta-analysis. Ann Emerg Med. 2001;37:461-70. Kudenchuk PJ, Maynard C, Cobb LA, et al. Utility of the prehospital electrocardiogram in diagnosing acute coronary syndromes: the Myocardial Infarction Triage and Intervention (MITI) Project. J Am Coll Cardiol. 1998;32:17-27. Feldman JA, Brinsfield K, Bernard S, et al. Real-time paramedic compared with blinded physician identification of ST-segment elevation myocardial infarction: results of an observational study. Am J Emerg Med. 2005;23:443-8. Le May MR, Dionne R, Maloney J, et al. Diagnostic performance and potential clinical impact of advanced care paramedic interpretation of ST-segment elevation myocardial infarction in the field. CJEM. 2006;8:401-7.
van ‘t Hof AW, Rasoul S, van de Wetering H, et al. Feasibility and benefit of prehospital diagnosis, triage, and therapy by paramedics only in patients who are candidates for primary angioplasty for acute myocardial infarction. Am Heart J. 2006;151:1255 e1-5. Foster DB, Dufendach JH, Barkdoll CM, et al. Prehospital recognition of AMI using independent nurse/paramedic 12-lead ECG evaluation: impact on in-hospital times to thrombolysis in a rural community hospital. Am J Emerg Med. 1994;12:25-31. Millar-Craig MW, Joy AV, Adamowicz M, et al. Reduction in treatment delay by paramedic ECG diagnosis of myocardial infarction with direct CCU admission. Heart. 1997;78:456-61. Verbeek PR, Ryan D, Turner L, et al. Serial prehospital 12-lead electrocardiograms increase identification of ST-segment elevation myocardial infarction. Prehosp Emerg Care. 2012;16:109-14. Bradley EH, Herrin J, Wang Y, et al. Strategies for reducing the door-to-balloon time in acute myocardial infarction. New Eng J Med. 2006;355:2308-20. Kudenchuk PJ, Ho MT, Weaver WD, et al. Accuracy of computer-interpreted electrocardiography in selecting patients for thrombolytic therapy. MITI Project Investigators. J Am Coll Cardiol. 1991;17:1486-91. Dhruva VN, Abdelhadi SI, Anis A, et al. ST-Segment Analysis Using Wireless Technology in Acute Myocardial Infarction (STAT-MI) trial. J Am Coll Cardiol. 2007;50:509-13. Keeley EC, Boura JA, Grines CL. Primary angioplasty versus intravenous thrombolytic therapy for acute myocardial infarction: a quantitative review of 23 randomised trials. Lancet. 2003;361:13-20. McNamara RL, Wang Y, Herrin J, et al. Effect of door-to-balloon time on mortality in patients with ST-segment elevation myocardial infarction. J Am Coll Cardiol. 2006;47:2180-6. Nallamothu BK, Foxx KAA, Kennelly BM. Relationship of treatment delays and mortality in patients undergoing fibrinolysis and primary percutaneous coronary intervention. The Global Registry of Acute Coronary Events. Heart. 2007;93:1552-5. Armstrong PW and Boden WE. Reperfusion paradox in ST-segment elevation myocardial infarction. Ann Intern Med. 2011;155:389-91. Bates ER and Nallamothu BK. Commentary: the role of percutaneous coronary intervention in ST-segment-elevation myocardial infarction. Circulation. 2008;118:567-73. Langabeer JR 2nd, Dellifraine J, Fowler R, et al. Emergency medical services as a strategy for improving ST-elevation myocardial infarction system treatment times. J Emerg Med. 2014;46:355-62. Horvath SA, Xu K, Nwanyanwu F, et al. Impact of the prehospital activation strategy in patients with ST-elevation myocardial infarction undergoing primary percutaneous revascularization: a single center community hospital experience. Crit Pathw Cardiol. 2012;11:186-92. Indications for fibrinolytic therapy in suspected acute myocardial infarction: collaborative overview of early mortality and major morbidity results from all randomised trials of more than 1000 patients. Fibrinolytic Therapy Trialists’ (FTT) Collaborative Group. Lancet. 1994;343:311-22. Effect of intravenous APSAC on mortality after acute myocardial infarction: preliminary report of a placebo-controlled clinical trial. AIMS Trial Study Group. Lancet. 1988;1:545-9. O’Gara PT, Kushner FG, Ascheim DD, et al. 2013 ACCF/AHA guideline for the management of ST-elevation myocardial infarction: a report of the American College of Cardiology Foundation/American Heart Association Task Force on Practice Guidelines. Circulation. 2013;127:e362-425. Ibanez B, Macaya C, Sanchez-Brunete V, et al. Effect of early metoprolol on infarct size in ST-segment-elevation myocardial infarction patients undergoing primary percutaneous coronary intervention: the Effect of Metoprolol in Cardioprotection During an Acute Myocardial Infarction (METOCARD-CNIC) trial. Circulation. 2013;128:1495-503. Mateos A, Garcia-Lunar I, Garcia-Ruiz JM, et al. Efficacy and safety of out-of-hospital intravenous metoprolol administration in anterior ST-segment elevation acute myocardial infarction: insights from the METOCARD-CNIC trial. Ann Emerg Med. 2015;65:318-24. Kupas DF, Schenk E, Sholl JM, et al. Characteristics of statewide protocols for emergency medical services in the United States. Prehosp Emerg Care. 2015;19:292-301. National Model EMS Clinical Guidelines. 2014. Available at: https://www.nasemso.org/Projects/ModelEMSClinicalGuidelines/index.asp. Accessed Jun 15, 2015. Tataris KL, Mercer MP, Govindarajan P. Prehospital aspirin administration for acute coronary syndrome (ACS) in the USA: an EMS quality assessment using the NEMSIS 2011 database. Emerg Med J. 2015;32(11):876-81.